Egg nog has been around for ages: it was most likely invented back in the days when America was still a British colony. The name “egg nog” would in this case stem from “egg grog” – grog was the name the colonists used for rum. Not everyone agrees, though: some historians claim the drink originated in Europe, and was later exported to the future United States. As per this explanation, the term “nog” would derive from “noggin”, a wooden cup in which drinks were served. The drink itself would be an evolution of “dry sack posset”, a mixture of sherry and milk. What is certain though is that egg nog is traditionally made with eggs, milk and sugar – and usually a generous dose of some sort of alcohol, most commonly rum, whiskey, brandy or cognac. Egg nog can be "personalized" to suit your own taste by adding spices (nutmeg and cinnamon are the most popular) and by adding cream, to make the drink thicker and richer. 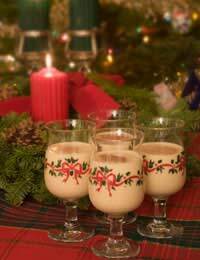 Egg nog has become popular all over the world: the Mexicans, for example, call it “rompope”. Rompope is your basic egg nog with plenty of Mexican cinnamon, ground almonds and rum stirred in. It is traditionally drunk cold from little glasses. In Puerto Rico egg nog is made with coconut milk instead of regular cow’s milk, which gives it a particularly exotic flavour. Given the Germans’ predilection for beer, it should hardly come as a surprise that egg nog (or “egg soup”) is spiked with beer there, rather than with rum or brandy. And Peruvians prefer to liven up their nog (which they call “biblia con pisco”) with their national type of pomace brandy. Chill all the liquids. Beat the eggs untill they become frothy. Gradually beat in the sugar, vanilla and nutmeg. Stir in the milk, cream, brandy and rum. Chill before serving. If you enjoyed this, why not try hot buttered rum this Christmas too?